WhatIfSports.com fired up its college basketball simulation engine to play the entire 2017 NCAA Tournament 1,001 times. View the full 2017 bracket predictions and picks or check out our region-by-region previews. After you’ve done your homework, create an entry in the FOX Sports / SI Bracket Challenge. A season ago, Villanova entered the NCAA Tournament as a No. 2 seed with a penchant for early exits. A year later, the defending national champions are the tournament’s No. 1 overall seed and are on the short list of title favorites. Villanova’s balanced attack includes key production from Jalen Brunson (14.8 PPG, 4.2 APG), Kris Jenkins (13.4 PPG, 4.2 RPG) and Mikal Bridges (9.9 PPG, 1.7 SPG), but make no mistake that it’s Big East Player of the Year Josh Hart (18.9 PPG, 6.5 RPG) that stirs the Wildcats’ drink. In three Big East Tournament victories, Hart upped his production to averages of 21.0 points and 7.3 boards, including a game-winning stick-back against Seton Hall with nine seconds remaining. 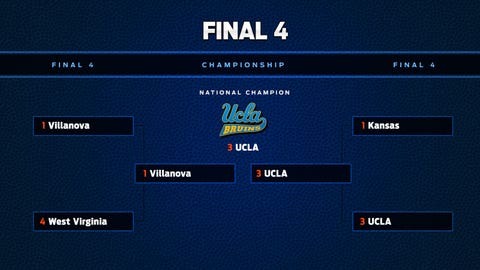 In 1,001 simulations of the NCAA Tournament, Villanova cut down the nets 10.4 percent of the time, trailing only UCLA (13.7 percent) for highest championship odds. The Wildcats are the most likely to emerge from the East Region into the Final Four, with their 34.1 percent chance beating out Duke (15.9 percent). Duke’s 2016-17 campaign was not without its challenges. Star guard Grayson Allen was suspended one game for a tripping incident against Elon and the Blue Devils lost to Virginia Tech in his absence. Coach Mike Krzyzewski missed seven games in January while recovering from back surgery and associate coach Jeff Capel led the team to a 4-3 record. More recently, Duke ended conference play by losing three of four games. However, the Blue Devils rallied when it mattered most, winning four games in four days to capture the ACC Tournament championship. Their run featured three wins over AP Top 25 teams, including No. 1 seed North Carolina and No. 2 seed Louisville. 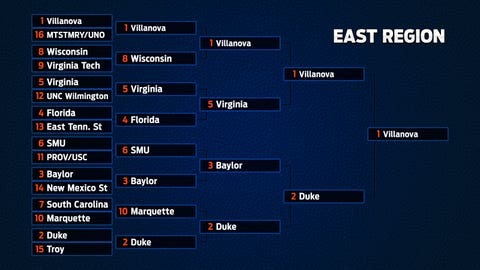 In WhatIfSports.com’s simulation of the tournament field, Duke reached the Sweet 16 48.6 percent of the time and advanced to the Elite Eight in 29.1 percent of simulations. Duke’s Final Four odds are 15.9 percent, which ranks ninth among all 68 tournament teams. The simulation gives Duke a 3.7 percent chance of winning it all, second-highest among No. 2 seeds (trailing Louisville’s 4.3 percent). After beginning the season unranked, the Baylor Bears rose to No. 1 in the AP poll on the strength of a 15-0 start. The perch atop the rankings lasted just one week, with West Virginia knocking off Baylor in Morgantown. The Bears responded with five more wins to improve to 20-1, but have faltered down the stretch. Baylor is 5-6 in its last 11 games, including an early exit in the Big 12 quarterfinals to Kansas State. If the Bears are able to get back to their winning ways, it’ll be rangy big man Johnathan Motley leading the way. A matchup nightmare for most opposing teams, Motley averaged team-highs in points (17.3) and rebounds (9.9). Baylor should make easy work of its first round opponent, New Mexico State. WhatIfSports.com gives the Bears a 75.3 percent chance of winning Friday afternoon. After that, a potential second round matchup against No. 6 seed SMU could be trouble. 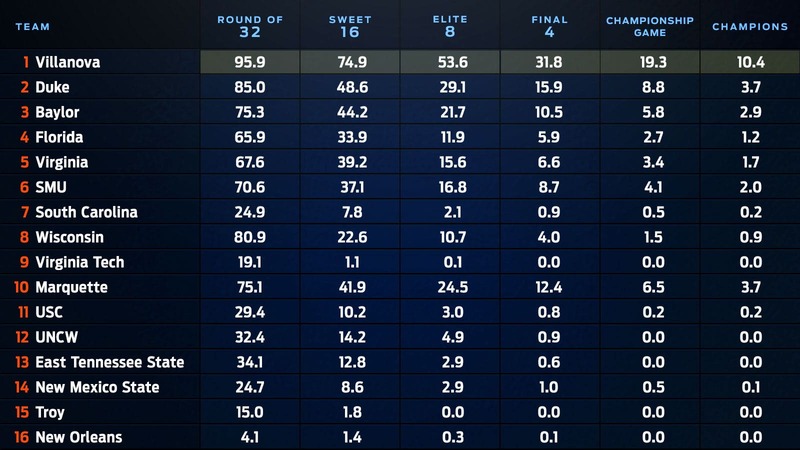 Baylor advanced to the Sweet 16 in 44.2 percent of simulations, but SMU isn’t far behind at 37.1 percent. The Bears’ Final Four odds stand at 10.5 percent, and they have a 2.9 percent chance of winning the championship. The good news for Florida? Vanderbilt is in the West Region and wouldn’t face the Gators until the Final Four. Vandy represents three of Florida’s eight losses, including the last two of the season. Aside from the Commodores, Florida demonstrated that it can hang with any team this season. The Gators split with fellow SEC NCAA Tournament teams Kentucky and South Carolina, and was 2-0 against Arkansas. During a tough nonconference slate, Florida picked up wins over Seton Hall and Miami, while dropping close contests to Gonzaga, Duke and Florida State. The Gators are led by sophomore guard KeVaughn Allen (13.9 PPG) and Canyon Barry (12.1 PPG), son of NBA Hall-of-Famer Rick Barry. WhatIfSports.com gives the Gators a 65.9 percent chance of advancing past East Tennessee State into the round of 32. Florida’s 5.9 percent chance to reach the Final Four ranks behind some other East Region teams with higher seeds, including No. 5 Virginia (6.6 percent), No. 6 SMU (8.7 percent) and No. 10 Marquette (10.4 percent).